Left to right: Charles Koven, Nathan Howard, Scott French. Not pictured: William Riley, David Lawrence, Min Si. Image: Margie Wylie, Berkeley Lab22 Mar 2016 Berkeley - The Department of Energy's National Energy Research Scientific Computing Center (NERSC) announced the winners of the 2016 High Performance Computing (HPC) Achievement Awards on March 22, 2016 during the annual NERSC Users Group meeting at Berkeley Lab. The awards recognize NERSC users who have either demonstrated an innovative use of HPC resources to solve a scientific problem or whose work has had an exceptional impact on scientific understanding or society. To encourage younger scientists who are using HPC in their research, NERSC also features two early career awards. 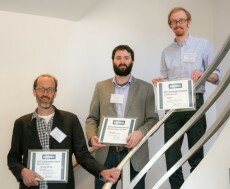 "While many of NERSC's users are longtime users who have a consistent record of accomplishment, it's important that we also acknowledge the innovative work of those in the formative years of their work, as evidenced by our Early Career award winners", stated Richard Gerber, NERSC Senior Science Advisor. "These young researchers are the future of science and they bring new ideas, new perspectives and new energy to their chosen fields." Charles Koven and William Riley of Berkeley Lab's Climate and Ecosystem Sciences Division and David Lawrence of the National Center for Atmospheric Research were honoured for their role in using an Earth system model to demonstrate the atmospheric effect of emissions released from carbon sequestered in melting permafrost soil. Running simulations on NERSC's Hopper system, the team demonstrated that thawing permafrost releases enormous amounts of long-frozen carbon into the atmosphere - more than carbon taken by plants. The model is the first to represent permafrost processes as well as the dynamics of carbon and nitrogen in the soil. According to the simulations, by the year 2300 - if climate change continues unchecked - the net loss of carbon to the atmosphere from Arctic permafrost would range from between 21 petagrams and 164 petagrams. That's equivalent to between two years and 16 years of human-induced CO2 emissions. "We found the rate of permafrost thaw and its effect on the decomposition of deep carbon will have a much bigger impact on the carbon cycle than the availability of deep nitrogen and its ability to spark plant growth", Charles Koven stated. Their findings were reported in theProceedings of the National Academy of Sciencesin March 2015. Nathan Howard, a research scientist at MIT's Plasma Science and Fusion Center, is being honoured in this category for his pioneering computational work in plasma turbulence simulations. In particular, Nathan Howard - who was a postdoc at the University of California, San Diego until joining MIT in 2015 - carried out the most physically comprehensive simulations of tokamak plasma microturbulence to date, according to Christopher Holland, associate research scientist in the Center for Energy Research at UCSD, who nominated Nathan Howard for this award. One roadblock in the quest for fusion is that, to date, computer models have often been unable to predict exactly how turbulence will behave inside the reactor. In fact, there have long been differences between predictions and experimental results in fusion experiments when studying how turbulence contributes to heat loss in the confined plasma. But Nathan Howard discovered a solution to this disparity: By performing high-resolution multi-scale simulations, the team was able to simultaneously resolve multiple turbulence instabilities that have previously been treated in separate simulations. A series of these multi-scale simulations run on NERSC's Edison system found that interactions between turbulence at the tiniest scale (that of electrons) and turbulence at a scale 60 times larger (that of ions) can account for the mysterious mismatch between theoretical predictions and experimental observations of the heat loss. These groundbreaking simulations used well over 100 million core-hours of computing time, and Nathan Howard was the top user of NERSC computer time in 2014 and in the top five for 2015. The results resolved a long-standing model-experiment discrepancy and led to the most significant advance in our understanding of tokamak turbulence in over a decade, according to Christopher Holland. Former Berkeley Lab computational scientist Scott French was honoured in this category for his role in helping seismologists create a unique 3D scan of the Earth's interior that resolved some long-standing questions about mantle plumes and volcanic hotspots. Working with Barbara Romanowicz, a professor of earth and planetary science at UC Berkeley, Scott French - who now works for Google - ran a number of simulations at NERSC, producing for the first time a computed tomography scan that conclusively connects plumes of hot rock rising through the mantle with surface hotspots that generate volcanic island chains like Hawaii, Samoa and Iceland. Until this study, evidence for the plume and hotspot theory had been circumstantial, and some seismologists argued instead that hotspots are very shallow pools of hot rock feeding magma chambers under volcanoes. To create the high-resolution 3D image of Earth, French ran numerical simulations of how seismic waves travel through the mantle and compared their predictions to ground motion actually measured by detectors around the globe. They mapped mantle plumes by analyzing the paths of seismic waves bouncing around Earth's interior after 273 strong earthquakes that shook the globe over the past 20 years. The simulations, run on NERSC's Edison system, computed all components of the seismic waves. Scott French tweaked the model repeatedly to fit recorded data using a method similar to statistical regression. The final computation required 3 million CPU hours on Edison; parallel computing shrank this to a couple of weeks. Min Si, a graduate student from the University of Tokyo who is working at Argonne National Laboratory, was selected for this award for her pioneering work in developing novel system software in the context of MPI­3 one­-sided communication. This software has had a transformative impact on the field of computational chemistry by completely eliminating the need for custom ports of global arrays, stated Jeff Hammond, a research scientist in the Parallel Computing Lab at Intel Labs, who nominated Min Si for the award. The tool Min Si created is Casper, a library that sits between an MPI­3 application and any MPI implementation, including proprietary ones such as Cray MPI and Intel MPI. When Casper is used, the application sees an ideal implementation of MPI­3: it makes excellent asynchronous progress for all operations, including noncontiguous and accumulating one­sided operations that are rarely, if ever, supported in hardware. This is achieved without the usual overheads of asynchronous progress, which include mutual exclusion and oversubscription resulting from communication helper threads. Casper is a boon to MPI­3 users and implementers because it resolves the long­standing tension over asynchronous progress, which torments both groups because it previously was not possible to achieve it without trade­offs. Using Casper, NWChem runs as fast using MPI­3 as it does using DMAPP on NERSC Cray XC systems without compromising all of the productive features of MPI, such as profiling and debugging tool support, noted Jeff Hammond, who previously worked as a computational scientist at Argonne. "This project has greatly benefitted my work with NWChem because I no longer have to spend any effort porting or debugging global arrays and there is no loss of performance associated with the use of MPI­3", he stated.